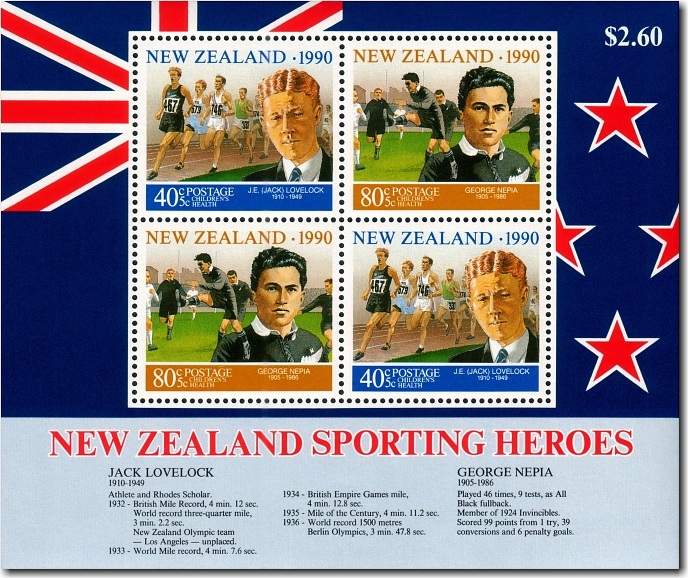 The 1990 Health stamps featured two sporting heroes from the 1920s and 1930s - around the time of the first New Zealand health stamps. John "Jack" Edward Lovelock (5 January 1910 - 28 December 1949) was born in Crushington (near Reefton) and showed a talent for sports while at Timaru Boys' High School. By 1933 - already holder of the British Empire record for the mile - he set a new world record of 4:07.6. The highlight of his career came in 1936 when he won the gold medal in the 1500 metres at the Berlin Olympics games, setting a new world record in the final (3:47.8). In that race he beat Glenn Cunningham and both athletes broke the previous world record in that event. Jack studied medicine at the University of Otago and became a Rhodes Scholar at Exeter College, Oxford. He graduated as a medical practitioner and in 1946 was appointed to the staff of Manhattan Hospital, New York. He died tragically in 1949 when he collapsed in front of a New York subway train at the Church Avenue station, having telephoned his wife from work saying he was coming home early because he wasn't feeling well. George Nepia (25 April 1905 - 27 June 1986) was a MÄori rugby union and rugby league player. He was an exceptional full-back and one of the most famous MÄori rugby players, playing 46 matches for the All Blacks and scoring a total of 99 points. He was inducted into the New Zealand Sports Hall of Fame in 1990 and has been described as "New Zealand rugby's first superstar". A miniature sheet featuring two copies of each stamp was issued.